Do you really need a communication tool? We can all communicate easily enough when we’re sat next to each other in the office, but what if we’re working with remote teams, working asynchronously or in different timezones? Projects often go off the rails because of simple misunderstandings – because conversations that should happen, don’t happen. So communication tools can help facilitate conversations that help us solve the challenge we all face of making sure everyone is on the same page. Let’s be real, leading (or being a part of) a successful team is a demanding task, it’s important to be able to quickly and easily have discussions to provide clarification and direction. Having the right info is crucial, of course, but having it at the right time is ideal, and these tools are here to help you get things done, through clear and timely team communication. Today, so many communication apps are inexpensive (or free)—it’s a no-brainer for agencies, studios and startups who need to coordinate the efforts of fast-paced projects performed by distributed teams. In fact, many young companies rely heavily on work communication apps until they’re ready to scale and upgrade to more comprehensive project management software. Here, we evaluate tools designed specifically for online communication at work. You’ll find out how to choose the right tool to elevate your team’s communication to the next level. Communication tools are apps that act as a virtual, online meeting room for team members. They help your team have conversations, exchange vital project data, update others with progress, share files, and create work collaboratively. If you are in the project managing game even for just a day, you know the important role that good communication plays in a team. Some of the more robust project management software tools out there already includes functionality for team communication, but here, we’re exploring the best in class tools specialized in communication. Nowadays, being online and connected with every team member is not a luxury, but a standard—and a good one at that. Within just a few years, Slack has ousted many of its rivals to become probably the most well-known and widely used communication tools. It’s pervasic, but is it necessarily the best? This tool is built around messaging in channels and threads. It’s flexible and fairly intuitive to use but with little way to organize the conversation within a thread, it can be easy to miss important parts of a conversation within the message stream. Slack supports direct messaging, group messaging, as well as audio and video conferencing. One well-designed feature Slack offers is its advanced search engine. You can search everything within the message threads and documents to quickly access previously shared information in any form. In terms of integrations, there’s nothing quite like Slack, with 1500+ integrations. If you’re using other project management tools, you’ll find there’s probably already an integration built for it – and this is probably the reason it’s become so popular as it can integrate with the other project management tools that people are already using. And for anything this tool lacks (such as a calendar module) you can easily integrate with the appropriate tool (Google Calendar). Slack supports iOS, Android, Windows, Mac, and even Linux. MS Teams is another trustworthy communication software from a highly competitive developer. MS Teams offers communication services for enterprises of all sizes, and it can stand on par with Slack and popular Slack alternatives. With its windows-style visuals, MS teams supports the team with live communications, and great threading of past and current data. Video conferencing, messaging, threads, file sharing and screen sharing, everything is there. Even if its push notification system falls a bit behind, integrations with other software like OpsGenie (for routing critical alerts to the right people) make up for it. MS Teams integrates with the whole MS package, of course, but also with Adobe Creative cloud, Trello, SurveyMonkey, Folly, Wrike, Jira and many, many more. As a communication tool, it integrates with lots of communication channels: email, Google apps, social media platforms, etc. And, of course, it integrates with your essentials on the cloud: Dropbox, Drive and OneDrive. Microsoft Teams costs from $6.00/user/month. Workplace from Facebook holds its own when it comes to the integrity of their comm channels and approach. This team communication software is made to enhance and streamline the communication between team members working closely together and to strengthen internal communications in general. Workplace offers live video and audio conferencing, file sharing, a private and group messaging system, and a great way to keep every bit of data in check via its streamlined threading system (plus unlimited storage for files, photos, and videos). Like most communication apps, it offers a simple desktop notification system for receiving updates about messages or scheduled events. What’s more, the application feels intuitive, showing a lot of similarity to the framework of the familiar social media platform. This makes it an easy tool to roll out, with easy onboarding that gets straight to the point without needing much training. Workplace by Facebook supports integrations with every mainstream tool your team might already be using, including Envoy, Jira, Zoom, Quip, and Salesforce. It also supports cloud services like Google Drive and Dropbox, and it can be integrated with scheduling apps and calendars like Google Calendar. Next, we have a Slack alternative communication software that openly presents itself as Slack’s biggest competitor. Ryver is more of a hybrid tool, supplying both communication and task management features. On top of its communication arsenal, Ryver offers task management features like task boards, file sharing, task checklists, etc. Ryver supports video and audio conferencing, group, private and guest messaging systems, and screen-to-screen sharing. Ryver’s streamlined threading of communication data is top-notch, but the push notification system might require a third-party app to work flawlessly, depending on how you’ll be using it. Ryver integrates with a whole bunch of popular apps, including Jira, Trello, Google Docs, SalesForce, GitHub, Asana, Dropbox, Google Drive and OneDrive. Cliq, by Zoho, markets itself as an app for smaller enterprises, but their visually beautiful solution for streamlining team communication could be a fit for larger organizations as well. Going beyond the capabilities of employee communication tools, Cliq offers the ability to grant permissions to external guest users, who can easily access and navigate the easy-to-learn app in order to participate in discussions and conferences. This team communication tool offers audio and video conferencing, private, group and board messages, and a good system for managing both internal and external contacts. Their discussion threading and search is up to standard, and their built-in calendar works well for simple scheduling, though users often like to integrate their own calendar system (such as Google Calendar). In terms of value for the price, Cliq is compelling—with unlimited storage and unlimited video calling, even the free version. Cliq by Zoho also integrates with many of the mainstream apps: Appear.in, BitBucket, Box, Meetup, Stack Overflow, Trello, GitLab, Twitter, various email services, Dropbox and Google Drive. Zoho Cliq costs from $3.00/user/month. Fleep is a network (just like Skype or FB Messenger) that allows you to communicate with other Fleep users, or with any team on Fleep. In addition to its communication featureset, Fleep offers a native task management feature, which is a rare find in most communication tools. Integration is Fleep’s answer to the question of busy digital workplace communication. Fleep offers audio and video conferencing through a built-in integration with appear.in, as well as individual chat and group chat. It offers options to make discussion boards, along with some corresponding document management and file sharing tools. It also offers a good system of push notifications, built-in search, and a screen sharing module. Fleep integrates with other project management tools like JIRA, Confluence, Trello, Slack, GitLab and Github. It can integrate with all the mainstream social networks, as well as work apps like Dropbox and the Google Suite. You can use the Fleep API to sync with other apps. Slenke combines of task management, time management, and communication. This tool is fairly new to the game (the company was founded in 2012), and offers a modern, clean, and visually beautiful interface. Rare among communication apps, Slenke does not offer a built-in video, audio conferencing, or screen sharing. It’s less of a stand-alone communications tool and more of a lightweight—but comprehensive—project management tool. In terms of communication, you can create messaging boards, and use both private and team chat. The notifications work as long as you are in the browser, and if you are using Windows OS, you can set them to be native to your PC. What this communication tool lacks in features, it makes up in integrations. Add video/audio conferencing by integrating with Zoom or Google Hangouts. Through Zapier, you can sync with 1000+ widely-used tools like GitHub, Slack, SalesForce, Google Docs, Google Calendar, Zoho, Trello, various email services, etc. Slenke costs from $50.00/month for the basic package. Flock is one of the most robust communication apps, going far beyond a simple messaging system. This communication app stands out with its chat module which is designed to streamline and centralize communication from different groups and across different teams. Going a step beyond “back and forth” communication, Flock enables you to turn messages into useful resources with bookmarks, and convert discussions into tasks. Flock’s features include video and audio calls, group and individual chats, and an intuitive screen sharing module. It also includes many nice-to-have communication tools, like the ability to create an anonymous poll, share it with your team, and download the results. You can also use tags in conversations to indicate high priority info. Another useful feature is the ability to automatically generate email lists of members in a particular discussion board, allowing you to quickly send out group emails to the right people. Flock integrations include Trello, Airtable, Paperform, Slack, Asana,GitHub, Facebook Lead Ads, Twitter, Reddit, Evernote, Dropbox, Google Doc and Google Calendar, Office 365, and many more. Rocket Chat is an open source Slack alternative communication software. This is a great tool for users with some degree of technical expertise. In addition to being open source, Rocket Chat also provides the option to host a chat room for your team on your own server. This provides extra security, of course, but requires a bit more setup. Rocket Chat does what the name suggests. It has a video and audio-conferencing feature with screen sharing. Your team can use one-on-one and group chats, with the option to assign priorities to different conversation threads. The notifications system is simple and effective, where members use mentions to notify individual team members or group channels in their messages. As an open source app, Rocket Chat allows users to modify and integrate it with a large number of applications and tools such asTrello, Jira, Github and GitLab, Gmail, Slack, Freshdesk, Google Docs, and Dropbox. They’ve got a REST API, LiveChat API, and Real time API for building your own integrations, as well as Plugins for integrating Rocket Chat features into your other platforms, themes for customizing the UI, and data importers for importing existing data from HipChat and Slack. Rocket Chat costs from $4.00/user/month. Teamwork Chat is designed as part of the Teamwork ecosystem. However, it has a lot to offer as a stand-alone communication app as well. Teamwork chat proves to be the best for teams that share a lot of external links and media, like videos and news articles, making itself very useful for marketing, creative, and advertising teams. Teamwork Chat offers video and audio-conferencing, screen sharing, group and private messaging, and a visually beautiful interface with streamlined communication threading. A useful feature of this tool is that you can answer emails directly from within the app. Also helpful is the ability to tag team members on urgent messages. 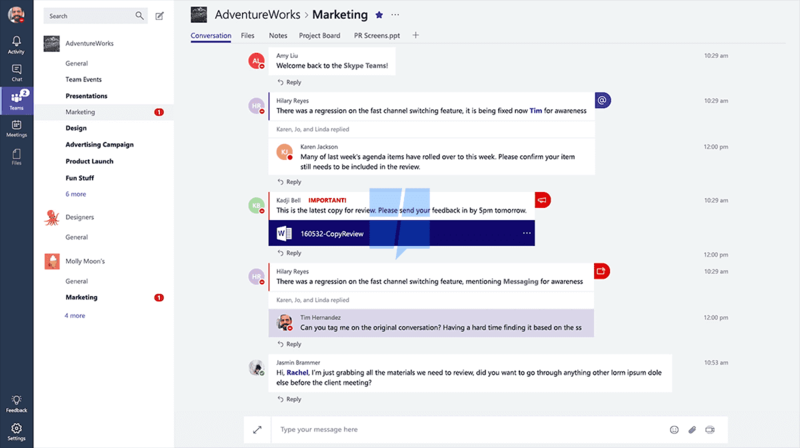 Being native to the Teamwork ecosystem, this communication tool integrates with the same third party tools that Teamwork integrates with: Slack, Asana, SalesForce, Trello, Gravity Forms, Google Docs and Calendar, Gmail, Drive and Dropbox. Teamwork Chat is free as a stand-alone apps, and costs from $7.00/user/month as part of the Teamwork Desk app. There are so many communication tools out there—here are are a few good options that we haven’t included in this review. Check them out! Messaging – Text based communication is the bread and butter of communication. The best communication tools offer multiple ways to message, including direct messaging, private chat, group chat, threaded discussions, open forums, and team- or group-based messaging. Team messaging apps should allow you to upload and share documents as well as the all-important cat GIF or latest meme. Group/private messaging – Of all the messaging features, it’s fundamental that the tool lets you send both private, 1-on-1 messages and group messages. Threading – A vital component of communication is knowing exactly where you are with a certain project. Communication tools should have threaded communication that provides an easily-searchable record of past communication. Notifications – Whenever a message, call, thread change or any type of communication occurs, the right people need to be notified. The notifications feature should allow you to update your preferences so your notification feed includes all of the relevant updates without cluttering up your feed with unrelated updates. Video calling – Video calling is a necessary feature for distributed teams, but it’s also a great tool for agencies who need to hold meetings with out-of-town clients. At the minimum, we look for high quality video calling. Additionally, some communication tools support live video feeds and video conferencing with easy guest access (a must-have if you plan to invite attendees from outside your organization). Screen sharing – A picture is worth a thousand words so being able to share exactly what you see on your screen with team members, and guide them through the details can save an enormous amount of time. This is especially important for business communication tools where you’ll be walking clients through your digital product or progress. Price – Team communication software is often available with a basic version for free, and on average we see communication tools priced in the range of $3-$7/user/month. How To Pick The Best Online Communication Tools For Your Team? One thing is for sure: There’s no good team if there’s bad communication. Using the right communication tool is a way to set up your teams for success. Let’s talk about what to factor into the equation while in choosing between communication tools for your team. 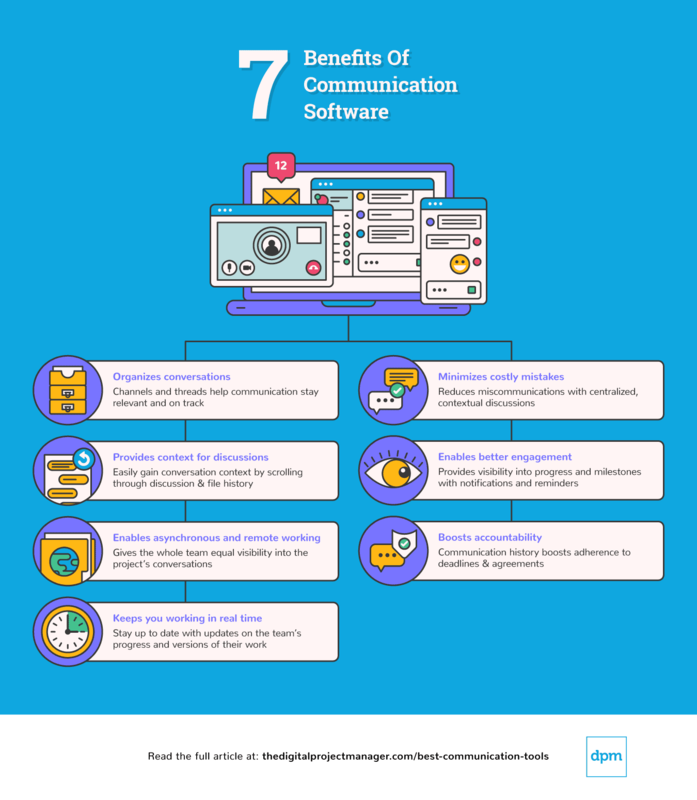 What Do You Need Communication Software For? Are you upgrading from an old communication system and need to import existing data, or are you starting fresh? Also, what are the needs of your team? If you communicate via video, then consider Slack, or popular Slack alternatives like Flock or Ryver. If your team has no need for video or audio calls, maybe Slenke or Rocket Chat are for you. What’s The Size Of Your Team? Getting everyone to use the same app can be hard to do, especially when your team is large and diverse in terms of technical literacy, location, project, etc. Robust tools with different levels of user permissions and guest access, like Microsoft Teams, are a good fit for large, distributed teams. If you have a closely-knit, tech-savvy team, Rocket Chat is a good choice because of it’s capabilities an an open source tool. How Would It Fit Into Your Workflow? This is often a matter of integration. Make a list of the tools you use to get the projects done. If you already of a collection of time tracking, invoicing (etc) apps, then consider Fleep or Zoho Cliq, with a large library of prebuilt integrations. On the other hand, if your toolkit is minimal now but you can see your operations scaling, try out a solution like Slenke, which offers project management and task management features to help out as you scale. Make a list of your integration requirements, and check it twice—and it doesn’t hurt to ask your team members what they use in terms of additional software and what they prefer. How Long To Set It Up? Most communication tools are intuitive to use and setup as an online app. However, if you prefer to host on your own servers, that takes a bit more time. Rocket Chat has a professional team to assist you, and Slack is a popular choice with good support. Either way, it depends on data sensitivity and the amount of data traffic your team expects. Whether you are getting a new communication system, or upgrading from an old one, everyone involved needs to get accustomed to the changes. Change management is often made easier with simple-to-use interfaces. Teamwork Chat is an example of a visually simple, easy-to-learn tool. Keep in mind that your team isn’t the only one using it—you might have clients or people who are not part of your day-to-day processes needing access to video conferences; if this is the case, make sure there’s an intuitive client portal. What’s your budget for a communication tool? Investing in communication tools is a good idea, but remember that less is often more—the good news is that many communication tools have a “free forever” version with limited functionality. The free communication tools version may serve your team’s needs just fine, offering all the “must-haves” without being overly complicated with the “nice-to-haves”. What are your experiences with team communication software? Are you a Slack fan, or do you prefer one of the alternatives? Comment below, or join our community of digital project managers on Slack to ask questions, get answers, and weigh in on the topics that you’re passionate about.